Novotel Paris Eiffel Tower is a four star property located in the heart of the city opposite the Seine river and a short distance from the Eiffel Tower. All accommodations are provided with air conditioning, flat screen TV with satellite channels, fridge, safe deposit box, mini bar and bathroom with hair dryer. From breakfast to lunch, dinner or a tasty little snack, the hotel houses a bar and two dining outlets which include Japanese restaurant, featuring sushi bar overlooking the Seine. Leisure facilities include an indoor heated swimming pool, fitness centre and video game area. Services and facilities offered include concierge, dry cleaning, paid parking and wireless internet access throughout. Additional attractions in the area include the Champs Elysees, Arc de Triomphe, Louvre and Notre Dame. The Novotel Paris Eiffel Tower is 18 km away from Paris Orly Airport and 30 km drive from Paris Charles de Gaulle Airport. The NOVOTEL TOUR EIFFEL is a Tourist, Business hotel. Located in City Centre - Eiffel Tower area. Shopping is within walking distance and the nightlife/restaurants are located in the hotel. 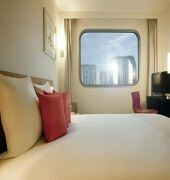 Descriptionclass="small" style="text-align: justify; font-size:11px;">Novotel Paris Eiffel Tower is a four star property located in the heart of the city opposite the Seine river and a short distance from the Eiffel Tower. All accommodations are provided with air conditioning, flat screen TV with satellite channels, fridge, safe deposit box, mini bar and bathroom with hair dryer. 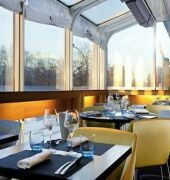 From breakfast to lunch, dinner or a tasty little snack, the hotel houses a bar and two dining outlets which include Japanese restaurant, featuring sushi bar overlooking the Seine. 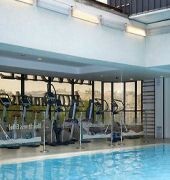 Leisure facilities include an indoor heated swimming pool, fitness centre and video game area. 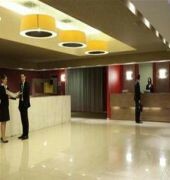 Services and facilities offered include concierge, dry cleaning, paid parking and wireless internet access throughout. Additional attractions in the area include the Champs Elysees, Arc de Triomphe, Louvre and Notre Dame. 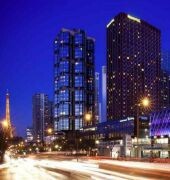 The Novotel Paris Eiffel Tower is 18 km away from Paris Orly Airport and 30 km drive from Paris Charles de Gaulle Airport.